In latest episode of so-called piegate, White House Press Secretary Sarah Sanders baked four pecan pies for a reporters’ potluck Christmas party. Before the Thursday night party, Sanders posted images related to the baking of the pecan pies via Twitter. 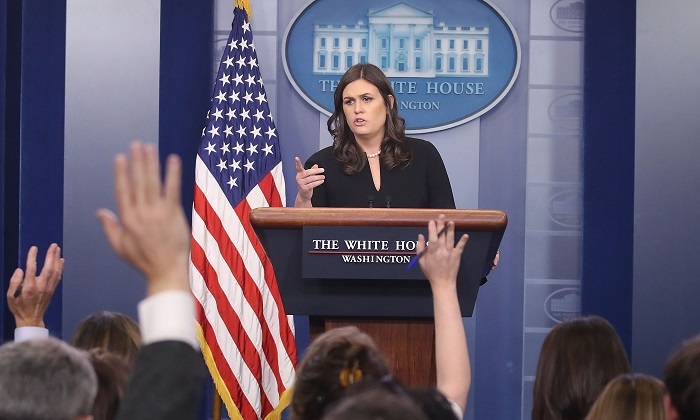 In her tweets, Sanders named April Ryan, a White House reporter and CNN political analyst, who created a storm in a tea cup when she tweeted her skepticism about an earlier pie-making claim by Sanders. Ryan was there on hand at the party to greet Sanders as she delivered the pies which proved to be a media event in of itself. In the video tweets below, Ryan claimed her questioning of Sander’s pie making was all a joke. Below is the pie tweet that began it all. A doubtful Ryan responded to that initial pie tweet via social media. “Show it to us on a table,” Ryan said back to Sanders via tweet. “I am not trying to be funny but folks are already saying #piegate and #fakepie. Show it to us on the table with folks eating it and a pic of you cooking it. I am getting the biggest laugh out of this. I am thankful for this laugh on Black Friday!” tweeted Ryan. Ryan’s statement brought on criticism in some quarters of the media, with even the Washington Post doing an op-ed on piegate – a piece that was welcomed by Sanders herself. Please support independent journalism by sharing this article. Thank you!